I don’t think killing zombies is ever going to grow old. Grab some friends, build upgrades and defenses, and send the undead back to the grave in Zpocalypse 2! Zpocalypse 2: Defend the Burbs is a game for 2 to 5 players with tower defense elements, that can be played cooperatively or competitively, for ages 14 and up. The game supports a campaign that takes place over four chapters (plus a prologue), but players can jump into chapters 1-3 directly if desired. The box states that games require two hours, but my experience has been 90 minutes to three hours, depending on the scenario, your familiarity with the rules, and how much your group agonizes over tactical decisions. Like the first Zpocalypse game, Zpocalypse 2 is the product of a Kickstarter campaign. If you’ve played “Zpocalypse classic,” be aware that there are changes in the new game. This review focuses on how it stands on its own. 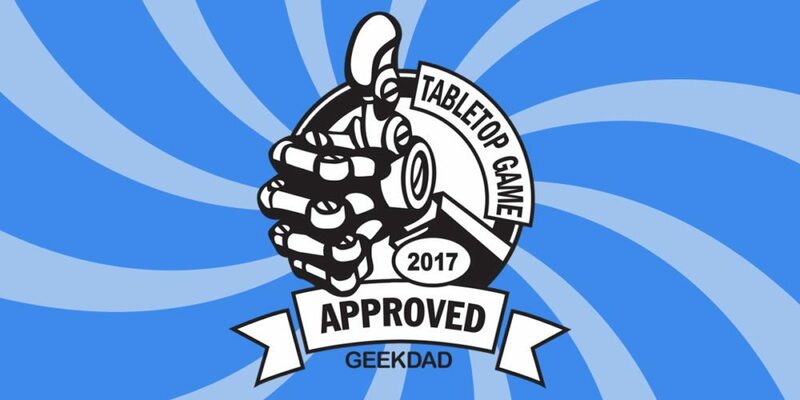 Zpocalypse 2: Defend the Burbs is GeekDad Approved! Zpocalypse 2 comes loaded with a lot of stuff, though it winds up being surprisingly easy to set up. An array of cardboard tokens for marking map locations, upgrades, and other game functions. There’s too much here to examine every piece; the short story is that this game was made with reverence. Character art is detailed and gritty, often based off real-world backers of the game. Flavor text adorns cards and makes them unique even when they have the same game mechanics. The squad boards, with their health and defense dials, have a high fun factor. There may only be two zombie sculpts, but they are gloriously decayed and detailed. The five zombie mutate sculpts convey their power and threat. If visual appeal is important to you in a game, you’re going to love Zpocalypse 2‘s components. A digital copy of the rules is available online. Each chapter in Zpocalypse 2 takes place over a number of days, with each day consisting of a day phase and a night phase. Day is where survivors look for food, weapons, and other resources, improve their defenses, and rest. At night, the zombies come out. Overall, the goal is simply to not die, but this is accomplished by managing the Doom Track. Zombies not killed before dawn wander off, but will come back with friends the next day. As the Doom Track moves higher, not only do more zombies spawn, but powerful mutates also arrive to threaten the players. Survivors can collect weapons, earn perks, and be critically wounded, making them both powerful and unique. The game tells the story of survivors escaping the city, setting up a base, and ultimately either finding sanctuary or surviving a massive zombie onslaught, depending on if you play cooperatively or competitively. Skill tests during the day and combat at night both use the same skill test system. The player rolls two dice for every survivor in their squad to create their action pool. A number of dice may then be applied to the skill being tested, be it firearms, melee, first aid, mechanics, sneak, or talk. The limitation is that no more dice may be applied than the individual survivor’s skill value. If the player is able to put dice towards the test with a total value meeting or exceeding either the weapon’s action point requirement, or the skill test number, the check succeeds. The core of the day phase takes place on the Action Board. Players take turns assigning members of their squad to one of four tasks: scavenge, craft, guard, or rest. Each is then resolved in turn. Scavenging. When scavenging, survivors follow the lead scavenger who selects and reads a vignette from the story booklet. The story gives multiple choices to the players that usually require different skills to succeed. For example, the party may encounter a wounded survivor ready to join the players. But to do so, players have to either patch them up using first aid, or fight their way out using melee, a more difficult task with a survivor strapped to someone’s back! Success usually nets more resources than failure, but more importantly, is more likely to obtain a new survivor ready to join one of the players’ squads. However, scavenging can also raise interest from the undead, and many outcomes raise the Doom Track, even when players succeed at a skill test. Crafting. The crafting element of Zpocalypse 2 really drew my interest. The owner of the first survivor assigned to crafting rolls a dice pool (see Skill Tests above). Players then assign dice to each survivor allocated to crafting to build weapons, fortifications, and base upgrades. In this way, players can make a number of useful items including molotov cocktails, bombs, junk walls, guard towers, kitchens, and infirmary beds. While weapons are consumable and have an obvious use, other upgrades help players heal, make it easier to feed squads, or make management of the Doom Track easier. Guarding. Survivors assigned to guard duty reduce the Doom Track by one point. This is a good counter to resting. Resting. Survivors resting without the benefit of infirmary beds (see crafting) heal 2 hit points, but raise the Doom Track by one point. This creates a nice tension between the need to heal and the spawning of more zombies, and makes crafting an infirmary bed a high-priority goal for the players. After resting, players must then feed their survivors (with food found from scavenging). Unfed survivors lose health. There are interesting choices to be made here, as some foods come with disease or radiation, and feeding your survivors with those items will induce long-term effects. Finally, players may contest the current first player for “leadership,” with the last player having the option of making it a contest. My sessions had players working cooperatively; this is of more interest to players looking for a versus experience within the game. At night, zombies spawn a number of fresh zombies equal to the position of the zombie meeple on the Doom Track. Additionally, if the Doom Track has crossed a multiple of 5, a random mutate is spawned in place of a fresh zombie. Zombies are placed around the players’ base, at north/west/east/south spawn locations. Players then place their squad tokens at locations of their choice inside their fortified house. Night is played out over five hours (turns). Each hour, the players roll to create an action pool for their squad (two dice per squad member) and then assign dice to various actions: movement, combat, or other abilities possessed by individual survivors. Once all players have taken their turn, the zombies move based on pathing rules, with the short version being that they hunt down the closest squad; otherwise, they look for a way into your base. All movement is done at the cost of one action point per space moved, though some terrain affects this. Player movement is limited by each squad’s lowest speed rating, while zombies always move three spaces each turn. One nice design choice here is that adjacency is defined as both orthogonal and diagonal – no messing around with partial movement points or the frustration of being diagonal to a zombie but unable to attack it. While this may create a couple of odd-looking attacks with ranged weapons, the simplicity of the system was a big advantage to making the game move along quickly. Player damage is never random; while you can’t control your dice pool, if you assign a die to use a weapon, and the target is in range, you deal that weapon’s damage. This is much more gratifying than rolling to see if you hit and works very well at drawing in all players to help figure out the best way to make the most of a dice pool. Fresh zombies (green) become weak zombies (grey) after taking a point of damage, and weak zombies are killed by a single point of damage, so there is never any doubt about whether a survivor’s weapon will put one down. Similarly, players can plan for the damage they’ll receive: each fresh zombie next to a player squad deals two damage while weak zombies deal one point. The exception is that when attacked by any number of zombies, there is a chance that players will receive a critical wound. This is determined by rolling two six-sided dice. If a Z (6) is rolled, a critical wound is drawn from the deck and assigned to a survivor. Not only do these deal damage, but they come with long-term effects such as losing a limb, having a chance to turn into a zombie each day, or gaining a mutation. Zombies that haven’t been sent back to the void by dawn wander off, remembering where you are, raising the Doom Track counter and bringing more friends with them the next night. This makes it in the players’ best interest to destroy every zombie they can before daylight. While other game elements (notably scavenging and resting) can raise the Doom Track, the primary feedback loop comes from leaving zombies wandering around when daylight hits. Individual players earn victory points by killing zombies, tracking their gains by moving their meeple across the Doom Track. Every five points nets them a Perk card. This is the equivalent of leveling up, and gives your survivors extra character. Perks can improve survivor skills, give them unique benefits, or even turn radiation that your players have received into powerful mutations, improving defense, damage dealt, or even healing critical wounds. If you’ve played Left 4 Dead you know who these guys are. Zpocalypse 2‘s mutates are powerful zombies, bringing upgraded challenges to a zombie onslaught. They have different health, movement, and attack rules than their green/gray counterparts and also come with unique attacks. For example, the Slimer attacks all survivors at once and can also infect with disease, while the Wailer summons more weak zombies to the fight. Their appearance is to be feared, and when they show up, they form a centerpiece of a memorable game. There are a number of other zombie games out there. I own Last Night on Earth (LNOE), and one of the groups I played with had experience with both Zombicide and Dead of Winter. We all found that Zpocalypse 2 compared favorably with them. In contrast with LNOE, I found that I highly enjoyed the fully cooperative approach. The character upgrading, through weapons and perks, felt more visceral and permanent than in LNOE. The progression through chapters helped reinforce that feeling, and we were excited to push on for the next day to see what we could find scavenging, and what we could build. One play group felt it was “very different” from other games they’ve played as well, and in particular, they found the story element quite rewarding. In fact, we found ourselves caring about the characters in front of us. Something about the art style, story, and gameplay caused us to occasionally narrate sections of the game, saying just how our weapons were hitting, what happened to zombies as they stumbled around, and generally adding humor on top of the grim situation. Additionally, we unanimously loved the way dice are used in the game, providing some randomness that you can direct and influence, rather than simply acting as hit-or-miss swings. After a full evening, everyone was keen to play again. Gripes with the game are minor. Some more variation in the base zombie sculpts would have been nice, but this is more than offset by the mutates. The squad action boards, because of their spinner hardware, don’t lie flat on a table and are prone to moving around. This is only a problem because the survivor cards and weapons are meant to be placed neatly underneath. If you have just a bit of OCD tugging at you, this is easily fixed with a bit of stick-tack or playing on a tablecloth. The biggest issue at this point are the gaps in the rules. Overall, they were on par with other games of similar scope, but there were enough omissions and contradictions to unduly slow down my first two games. Fortunately, partly based on my own experience, the team has a FAQ up (scroll down the linked page to find it), ready to answer your questions. Regardless, given the size of the game, I recommend that groups new to the game have one player dive in first and play the prologue solo, then teach the group (again starting with the prologue), to ensure a smooth first game. Zpocalypse 2 deftly combines tactics and strategy in a single game, bringing gritty fights, tower defense, and buckets of bloody flavor together in an apocalyptic feast straight from the garbage-can kitchen. Anyone who enjoys a game with strategic and tactical depth should find something here to like, but lovers of the zombie genre are in for a real treat. You can buy Zpocalypse 2 directly from Greenbrier Games for $59.95, or on Amazon.com. Disclosure: I received a review copy of this game, and I personally believe that the only good zombie is a decapitated zombie.